Built 1830 by Josef Kornhäusel. Opened 3 Oct 1830. After World War II, renamed "Divadlo Oldricha Stibora" in honour of the Czech theatre director, Oldrich Stibor (1901-1943). 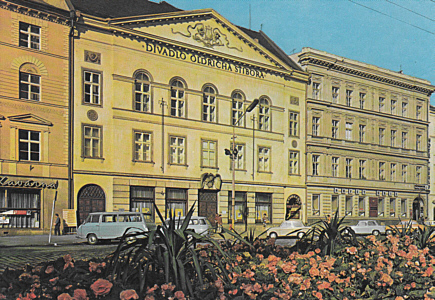 Later renamed "Moravské divadlo" (Moravian Theatre). 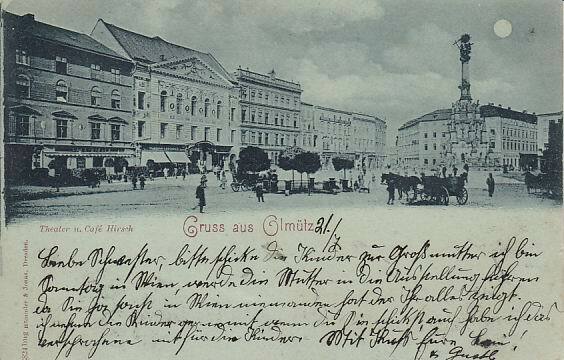 Front Text: "Gruss aus Olmütz - Theater u. Café Hirsch"
Front Text: inscription on building: "Divadlo Oldricha Stibora"
Reverse Text: "Olomouc, Divadlo Oldricha Stibora, Teatr i. Oldshicha Stribora, Oldrich-Stibor-Theater, Oldrich Stibor Theatre, Le théâtre Oldrich Stibor"